A South Grand oasis of cool gelato and steaming coffee. 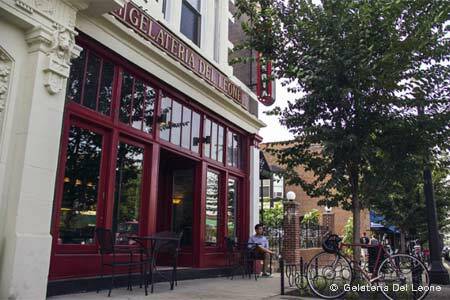 : The Gelateria is actually a café that offers lunch all day long, specializing in Italian-style flatbreads, calzone, panini, appetizers and a tasty tomato soup. Just be sure to save room for dessert. Or better yet, eat it first. During summer, many customers enjoy their treats on the shaded patio out back, next to the fountain. Come winter, everyone stays indoors, often making use of the free WiFi --- but that doesn’t mean they skip the gelato. A cup of zabaglione or pistachio or raspberry or stracciatella hits the spot no matter the season. The adventurous may try offbeat special flavors like ginger, salted caramel or bacon-pecan. Drinks fall mostly under the headers of espresso or tea, with some overlap in the frozen category with options like frozen chai tea latte or gelato shakes with a shot of espresso.